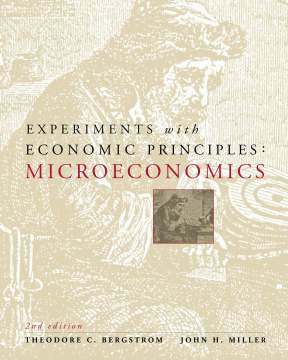 Taking a course in experimental economics is a little like going to dinner at a cannibal's house. Sometimes you will be the diner, sometimes you will be part of the dinner, sometimes both. If you take a laboratory course in the physical sciences, you get to mix smelly chemicals, or monkey with pulleys, or dissect a frog, but you are always the experimenter and never the subject of the experiment. In the market experiments conducted in this class, you and your classmates will be the participants in the markets as well as the scientific observers who try to understand the results. It is hard to imagine that a chemist can put herself in the place of a hydrogen molecule. A biologist who studies animal behavior is not likely to know what it feels like to be a duck. You are more fortunate. You are studying the behavior and interactions of people in economically interesting situations. And as one of these interacting economic agents, you will be able to experience the problems faced by such an agent first hand. We suspect that you will learn nearly as much about economic principles from your experience as a participant as you will from your analysis as an observer. Extracting Data From Classroom Trading Pits by Ted Bergstrom and Eugene Kwok. This analysis of buyer and seller behavior in Experiment 1 is based on a large sample of classroom observations. Some Corrections and Possible Variations for the Experiments. John H. Miller , miller@zia.hss.cmu.edu.